all surface water, moisture, liquids of the products. The products to be processed on the stainless steel conveyor where the surface water or moisture needs to be completely removed. FoodTec Air Knife machine exhausts high velocity air can be evenly controlled through the uniform slot design thereby supplying a powerful air flow across the entire surface of the products being processed. Blower-driven solutions that increase production efficiencies and save significant running costs. 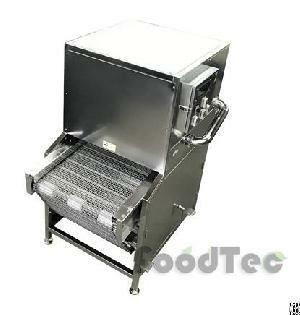 FoodTec Air Knife machine equipped with stainless steel conveyor suitable for use in the food industry for process drying, cooling and cleaning of conveyed products. Company Name: Foodtec Machinery Corp.
Street Address: No.16, Ln. 242, Sec.